We spoke to Overclockers' Gibbo today and he explained that the plan they're expecting to put into place, for the August 14 launch of the AMD RX Vega GPUs, will consist of an artificially high £1,000+ price tag, with a voucher code they're only posting on their gamers' forum to halve the price. 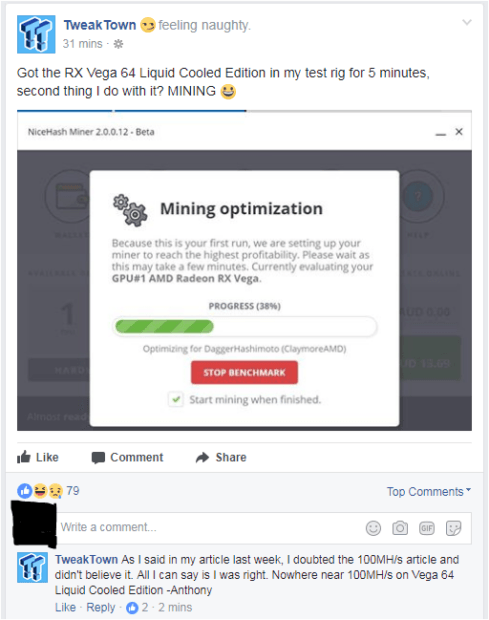 Those extra hoops for customers to jump through, combined with the one card per person limit, ought to ensure anyone looking to snaffle all the Vega GPUs for mining will look elsewhere. That will at least mean gamers in the UK will have somewhere to buy themselves one of AMD's latest high-end GPUs. What about corporates like Genesis Mining? Presumably they have means of buying in bulk. I'm sure plenty of etailers, like Amazon, will sell to anyone who orders.